Sarnia Observer, August 15, 1934. John S. Labatt has the unfortunate privilege of going down in history as Canada's first wealthy businessman to be held for ransom. His misadventure exploded into newspapers in August of 1934 after Labatt was snatched off the highway near his summer home on Lake Huron. Here, you will find a description of the kidnapping and trials that followed the event, as well as an exploration of the material related to the kidnapping that can be accessed at the Lambton Room. 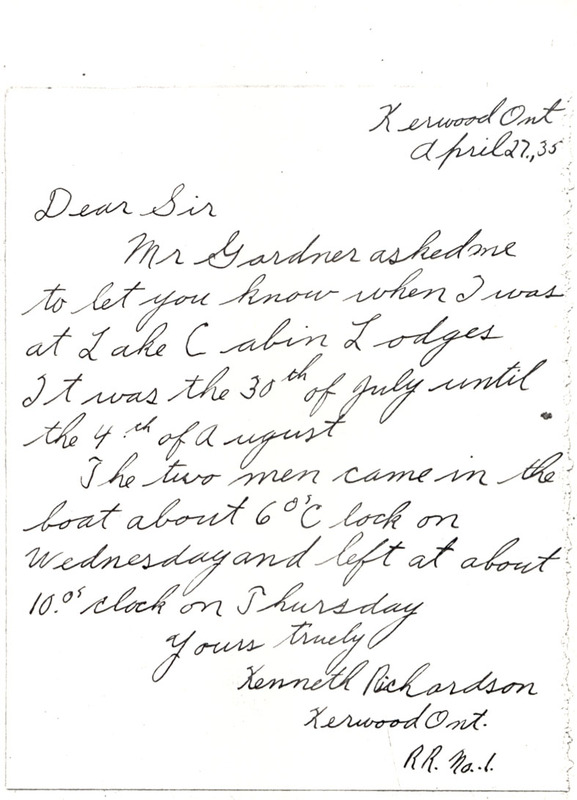 In the second week of August 1934, Labatt had been visiting his historic summer home "Faithorne," then owned by Sarnia realtor and broker H.F. Holland. The handsome property was nicknamed "The Lake Shore Gentry" and originally owned by Colonel Faithorne, commandant of the Essex, Kent and Lambton forces during the Fenian Raids. 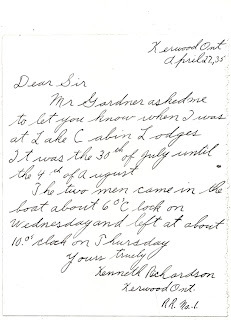 Labatt was heading from his Lambton County summer home to a meeting in London the morning of August 14th. He drove through Camlachie and decided to take a shortcut to Warwick, reportedly because he was running late for his meeting in London. He would never reach that destination. After spotting a fast-traveling, suspicious vehicle, Labatt was snatched off Egremont Road by four men. They drove Labatt to a cottage hideout in the Muskoka district, where he was reportedly fastened to a bed with a dog chain while the kidnappers sent a ransom note to Labatt's brother Hugh. One of the kidnappers phoned Hugh and told him to go to London's Victoria Hospital, where Hugh found his brother's car with a ransom note pinned to the upholstery. They demanded $150,000.00 for the safe return of the beer tycoon. Labatt was kept chained up in the kidnapper's cottage for three days. On August 17th, newspapers reported that Labatt "was turned loose from the kidnapper's car in [the early morning] in Northwest Toronto... about three and a half miles from the hotel where he turned up to join his brother Hugh." The episode deeply shook Labatt, who became reclusive and withdrawn after the incident. Sarnia Observer, August 17, 1934. The story does not end with the release of Labatt, and a flurry of media activity surrounded the subsequent criminal trials. In fact, the case culminated in Canada's first incident of mistaken identity. Three men were arrested and charged for the kidnapping (a fourth, the getaway car driver, was never found). One of the arrested men was David Meisner, a small-time gambler from Kentucky who was identified by Labatt from a series of mug shots. At Meisner's trial, Labatt looked him in the eye and asserted, "That's the man, there in the box. He left a picture in my mind I shall never forget." The stirring testimony landed Meisner in jail in spite of his excellent lawyer and alibi. The case was not sorted out until 1936, when "Piccolo Pete" Murray was pinned as Labatt's kidnapper and Meisner was re-tried with a verdict of not guilty. Meisner later sued and settled for $5,500.00 (around $95,000.00 today). Testimony of Kenneth Richardson, Kerwood. The Lambton Room has an interesting collection of material relating to Labatt's kidnapping and the trials that followed. There is a series of newspaper clippings from the mid-1930s that lead the reader through the tense days while Labatt was in captivity as well as the media circus that descended upon the criminal trials. John S. Labatt's sworn testimony from the trials can be found in its entirety. Notes from lawyers on both sides of the cases, as well as telegrams and letters from the RCMP and OPP relating to the case, are also available. We have photocopies of warrants from the investigation. A copy of the ransom note can be read, both the note written by kidnapper "Three-Fingered Abe" and the plea from John S. Labatt himself (the original is part of the University of Western Ontario collection). These primary sources provide vivid and up-close snippets of thekidnapping and subsequen trials. For anyone interested in reading more, Susan Goldenberg's 2004 publication, "Snatched! The Peculiar Kidnapping of Beer Tycoon John Labatt" is available at the Sarnia and Corunna library branches and explores the affair in detail. 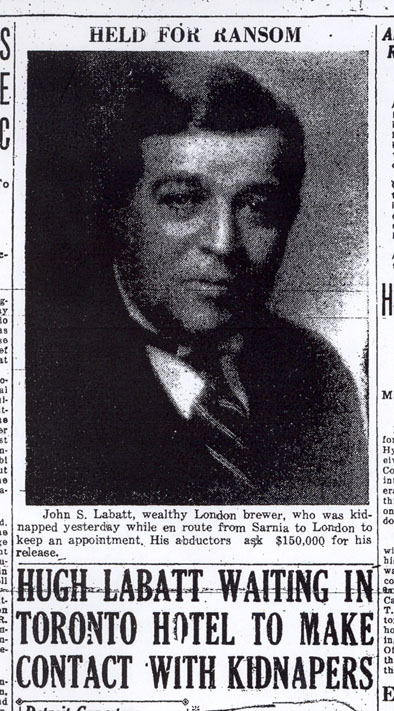 So the next time you sip a Labatt Blue or head down Egremont Road, take a minute to recall the extraordinary kidnapping of John S. Labatt and its intimate connection to Lambton County. Sarnia Observer, August 16, 1934. Lambton County residents involved in kidnapping case.